Audio Tag Editor for Linux - A tag editors are frequently used to organize multimedia files. It's an application that lets you to edit multimedia files metadata including title, artist, genre, album, track length, lyrics, embedded images, and other information be stored in the audio file itself. 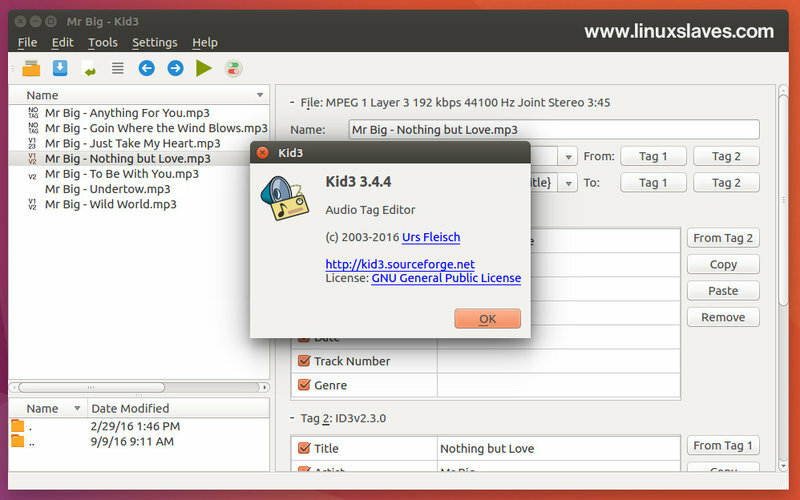 Today, I'll show you a step-by-step tutorial to install latest Kid3, an free, open-source and cross-platform audio tag editor for many audio file formats in Ubuntu. Kid3 runs under Linux (KDE or only Qt), Windows, Mac OS and Android and uses Qt, id3lib, libogg, libvorbis, libvorbisfile, libFLAC++, libFLAC, TagLib, Chromaprint. It supports DSF, MP3, Ogg, FLAC, MPC, MPEG-4 (mp4/m4a/m4b), AAC, Opus, SPX, TrueAudio, APE, WavPack, WMA, WAV, AIFF, tracker modules. The latest version of Kid3 is 3.4.4 which released in 23 Dec 2016. This bugfix release fixes the import of durations when importing from file or clipboard, and building with Chromaprint 1.4. New features include a portable mode storing the configuration file in the application folder, copying of images to the clipboard and an MPRIS D-Bus interface for the audio player on Linux. You can install or upgrade Kid3 3.4.4 via its PPA. The package available for Ubuntu 12.04 Precise Pangolin, 14.04 LTS Trusty Tahr, 16.04 LTS Xenial Xerus, 16.10 Yakkety Yak, and derivatives system. If you found a bug, create a bug report. If you need a feature, create a feature request. So, it's all I can write about Kid3 audio tag editor for Ubuntu and how to install or upgrade to latest version. For other operating system such as Mac OS, Windows and Android users, simply head to its official Kid3 download page.